Based on the miraculous event witnessed by America on a cold morning of January 2009, when a US Airways flight had to make an emergency landing on the Hudson River instead of the nearest New York airport, SULLY is one of those rare exceptional films which makes you rethink about life and the unseen force behind it we preferably love to name and remember as THE GOD. 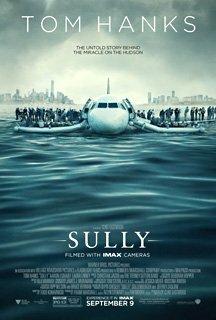 Moving into the must watch list of BTC for its excellence achieved, SULLY is realistically executed and has a very subtle, effective but ‘no overly dramatized’ presentation with no intention of sensationalizing the scary event for the obvious reasons. Becoming a perfect example of a film that strictly remains focused on the subject recreating the incident in a horrifying yet sensitive manner (with an excellent cinematography and sound) it takes you into the minds of its two main protagonists who were actually responsible for all those crucial decisions made in the nick of time, particularly the Captain Chesley “Sully” Sullenberger played by Tom Hanks. Though many might find the film not as exciting and explanatory as it ought to be, I would still love to strongly recommend SULLY to the readers for a few of my own reasons that you might not find in any of the film’s review or the usual write-ups. First of all SULLY simply amazes me as a near-to-perfect project conceived and visualized by an extremely gifted creator living his eighth decade of life, when most of the human faculties are normally not at their best, making way for many physical and mental complexities moving towards the final destination. Directed by the 86 years old maverick CLINT EASTWOOD with an incredible vision, well-supported by his lead actor TOM HANKS of 60 with an splendid ease, SULLY reminded me of our own DEV ANAND, who though didn’t churn out any quality films at all (since the 80s), but still kept working right till the last day of his life at the age of 89 as desired. Pointing towards probably the most precious gift for a person from the humble existence, Eastwood sets a fine example with his SULLY, making us realize that such gems are even possible at the age of 86. Secondly, the film makes you recall a very popular saying in India as “Jaako Raakhey Saaiyan, Maar Sakey Na Koye” – meaning “If that Supreme Power has decided to save a soul, then nothing in this universe can cause it any harm (not even a plane crash)”. And what better example can be there to prove this truthful saying. A plane hits into a big flock of geese only 3 minutes post its take-off resulting in failure of both the engines, an emergency landing needs to be made anywhere around with no time to reach the nearest airport, the pilot decides to make it land on the Hudson river in an extremely cold weather, the whole crash happens in just a few minutes and yet not even a single casualty is there with all the 155 people on board rescued well in time by the ground forces coming for an immediate help. Now what better example can be given to prove the Indian saying? Thirdly, this one incident makes it pretty clear to the entire world led by the amazing technical advancements, that any kind of man-made machine CANNOT be compared to a human mind at all, especially in those life threatening decisive moments of crises when some immediate decisions need to be made within a few seconds without caring about what’s actually written in the prescribed manuals by the experts. The film and its real-life case clearly proves the supremacy of a human mind over the machine quite evidently. Lastly but most importantly, SULLY reminds us about a brutally alarming truth that along with these amazingly helpful developments enhancing our living standards, we certainly have lost one important quality of life and that’s the ability of TRUSTING the other, without any hidden doubts. The fact is boldly visible in the film when despite the unbelievable miraculous landing on a river saving each and every life on the plane by its two pilots, they are still not trusted by the authorities and made to face an insulting trial investigating the actual happenings of the crash instead of honouring them for the same. Perhaps the whole world has changed post the 9/11 and we have lost the ability to ‘Trust’ valuing ‘Profit and Loss’ a lot more than the real valuable things. Anyway moving over the sad truth, do watch SULLY at the earliest as the film does have the power to reinstate your faith in both GOD and CINEMA together asking for a standing ovation. Among the best scenes of the film is the one where a female hotel manager is called in to take care of the two Captains staying in the hotel. And seeing Captain Sully, she hurriedly comes forward to hug him with love saying an emotional ‘Thank you’ straight from the heart. Interestingly the film did remind me of another ‘not-to-be-missed’ classic titled FLIGHT (2012) featuring Danzel Washington as the saviour captain caught in a similar situation. FLIGHT is also included in the ‘Must Watch List’ at the site. So do try to watch both….. if possible. Starring : Tom Hanks, Aaron Eckhart and more.